1. Line 24 cupcake trays with liners. 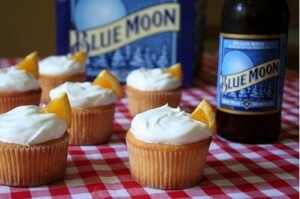 [Use white liners if you can, they become translucent during baking and really sell the mini Blue Moon image]. In a medium bowl, mix together flour, baking power and salt. 2. In a large bowl beat butter on medium speed for 30 seconds. Add sugar a little bit at a time, beating well. Once it’s all added beat for 2 more minutes. 3. Add eggs, beating after each. 5. Mix beer and milk in a measuring cup. Alternatively add beer / milk mixture and flour mixture to butter mixture in the large bowl, beating after each. End on the flour mixture. 6. Fill cupcake liners 2/3 full. Bake for 18 minutes at 375 degrees F until cupcakes are golden and a toothpick inserted in center comes out clean. 7. Once cool, frost each cupcake with a generous amount of frosting. Just before serving, garnish each with a small orange slice. 1. In a saucepan, mix sugar, water and cream of tartar. Cook on medium heat until sugar is dissolved and mixture is bubbly.